Cartographers often want to capture the way the height of an expanse of land changes. This is a “third dimension” of information, but usually they’re working on a two-dimensional, flat page, whether physical or digital. 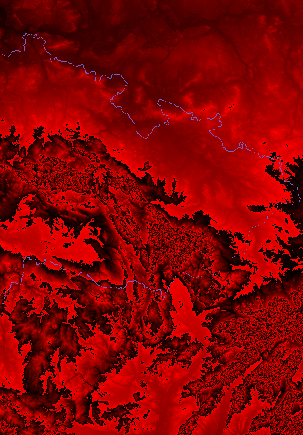 One solution is to use colour to represent height, as in this image of part of the Czech Republic. In this case the red tint it a bit unnecessary; today height maps are more commonly just made using shades of grey, with pure black representing the lowest point and white the highest. A more mathematical way to think about this would be to describe each shade of grey as a number. It doesn’t really matter how we do this, but it makes sense to make the lowest point a low number, the highest one a high number and ensure that shades that are close together are given close-together numbers. One way with real height data is to pick the height above sea level as the number. But you can use 0 for black and 1 for white, and all the fractions in between for the shades of grey, and that’s just what Photoshop (or whatever) does when it calls a shade “32% grey” — it’s attaching the number 0.32 to that particular shade. What we have now is called a “scalar field”. “Scalar” is just a fancy name for a number — why we have a fancy name for it, and why it’s “scalar”, would take us a bit off topic. The word “field” in this context just tells us we’re attaching a scalar to every point in the space we started with, which was the flat page. If we have our heights represented by a scalar field, all we do is join up all the points that have the same number attached to them (say, 30 in this example) and we get a contour line. New mathematical ideas are hard to think of, so once we come up with one we always see how much we can generalize it. And it turns out we can generalize the scalar field idea a lot. After all, a number is just a number. It needn’t represent height. It could, for example, represent temperature, pressure, wind speed, population density, wealth, rainfall and so on.What’s more, the flat page needn’t even represent a piece of physical ground: it can be an abstract “space” whose points represent any two-dimensional data. Even more generally, the underlying space needn’t “look” like a flat page. After all, the Earth is really (roughly) a sphere, but it still makes sense to attach a temperature-number (for example) to each point on its surface. So far this has all really been about visualizing data, but we can do more with it. For example, suppose we are “given” some space or other and don’t know what it looks like, for example when the space represents a large and complex set of data. 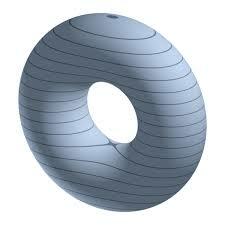 Maybe it’s a sphere, maybe it’s got a hole in it like a doughnut — we’d like to find out more about it. It turns out we can attach a scalar field to this mystery space and use its properties to find out about it. You can imagine slowly lowering the space into a bath of water; each contour line shows the shape is makes exactly where it breaks the surface at that height. Now, notice something very interesting about those lines. At the bottom each one looks like a distorted circle. But at some point the circle pinches into a figure-8 and splits into two circles. A bit later, the circles join to form one again. This behaviour would tell us there’s a hole in the space even if we couldn’t see the space itself. And this is the fundamental idea behind Morse theory. The really interesting bits are the “critical points” where something radically changes — a circle appears, it splits, the two join into one, and then the circle vanishes (when the torus is fully “submerged”). This reduces a vague problem to a very precise one and focuses us on a handful of points we need to look at. We were led to write a bit about this topic by this paper, a collaboration between artist Gemma Anderson (of Cornwall Morphology and Drawing Project) and three mathematicians. The paper considers the role of drawing in mathematical research, a topic we touched on in our Monday lecture earlier this term, and is full of fascinating visual glimpses of how mathematicians think before their work gets tidied up for publication.